Nearly all supplements on the market today contain Stearates; manufacturing agents used as lubricants to speed up production. Most capsules and tablets are made by mass production plants, which turn out a multitude of formulas for various companies. Magnesium Stearate, Stearic Acid and Silicon Dioxide are lubricants and fillers added to raw material in supplements so that production machinery will run at maximum speeds. These additives have a number of effects, including decreased absorption in addition to creating potentially allergenic reactions. In a study published in Pharmaceutical Technology (April, 1985), the percent dissolution of capsules after 20 minutes in solution went from 90% without Stearates to 25% with Stearates. These substances clearly affect the dissolution and rapid absorption of nutrients. GreenSilk has taken steps to provide our customers with the highest grade quality ingredients to sustain a healthy lifestyle. 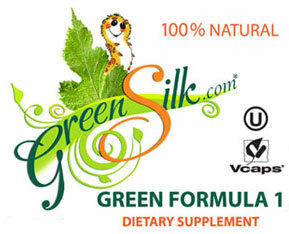 GreenSilk Formula 1 is a Professional High-Grade formulation that offers a safe and effective solution in supporting healthy blood sugars, full of antioxidants, protein, iron, vitamins and minerals ~ keeping you healthy naturally.